The half-moon shaped holes on this newly unfurled leaf are bite marks of a grasshopper that tasted the leaf and found this particular one unappealing. It moved down to feed on older tissue at the base of the plant. One of my dissertation chapters focuses on a greenhouse study, where I examined the plasticity of plant defensive strategies (resistance and tolerance) in Solidago altissima across a nutrient gradient. I found that plastic plant defense induction is itself plastic to nutrient environment. At high nutrient levels plants induced a resistance response while at low nutrient levels they tolerated the herbivory and produced more palatable leaf regrowth. This chapter was recently accepted for publication in the journal Functional Ecology. 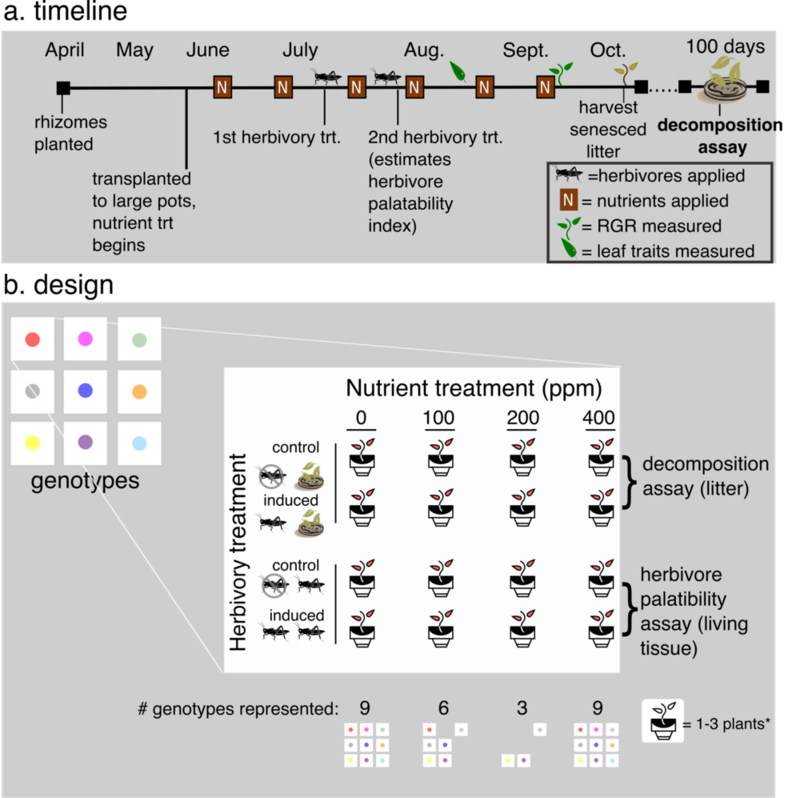 Genotypic means of a plant resistance index (-1 x herbivore relative growth rate) of individuals previously fed on by herbivores (induced plant) versus control plants (constitutive) across the nutrient treatment gradient (a.). The line±SE (shaded area) is a linear model relating y~ nutrient treatment. Control plants had lower resistance as nutrients increased while induced plants had higher resistance as nutrient levels increased resulting in a significant herbivory x nutrient level interaction. (b.) Plants at low nutrient levels exhibited induced susceptibility (lower resistance on induced plants), while high nutrient plants exhibited induced resistance (higher resistance on induced plants). *Indicates significant difference in resistance between constitutive and induced plants within a given nutrient treatment using a LMM. (c.) Behaviorally, herbivores shift to feeding on lower leaves of induced plants at high nutrient levels (mean± 95%CI of proportion of total feeding damage). Experimental plants growing in the greenhouse. Leaf trait changes in response to herbivory of living plant tissue across the nutrient gradient drive the differences in microbial processing of litter.